St. Paul, Minn., September 15, 2017 – PolyMet Mining Corp (“PolyMet” or the “company”) TSX: POM; NYSE AMERICAN: PLM – today reported that it has filed its financial results for the three and six months ended July 31, 2017. PolyMet also agreed to issue up to an additional $20 million secured debenture to Glencore AG, a wholly owned subsidiary of Glencore plc. “We appreciate and welcome Glencore’s continued financial and technical support. This gives us solid financial footing to advance the permitting process, in which tremendous progress has been made this year. We look forward to the state releasing the remaining draft permits for public review later this fall,” said Jon Cherry, president and CEO. More detail on the status of NorthMet permits can be found at: http://polymet.mn.gov/news.html. In November 2015, the Final Environmental Impact Statement was issued demonstrating that the NorthMet Project, as designed, is capable of being constructed and operated in compliance with environmental and human health standards. In 2016, the company submitted applications for the Permit to Mine, air quality permits, water discharge permits, water appropriation permits, and dam safety permits required to construct and operate NorthMet. In January 2017, the U.S. Forest Service issued its Final Record of Decision authorizing the land exchange. In June 2017, the company appointed Patrick Keenan as Chief Financial Officer. In June 2017, U.S. Rep. Rick Nolan, D-MN-8, introduced bipartisan legislation to direct the secretary of agriculture to move forward with the land exchange between PolyMet and the U.S. Forest Service, which will accelerate transfer and provide certainty of process. In August 2017, the Minnesota Department of Natural Resources released six draft water appropriation permits for 30-days of public review and comment. The comment period closed September 12, 2017. In September 2017, the company agreed to issue up to an additional $20 million secured debenture to Glencore AG, a wholly owned subsidiary of Glencore plc, to fund permitting and general corporate purposes. The debentures are on similar terms as the existing non-convertible senior secured debentures. Transfer of title to the surface rights over and around the NorthMet mineral rights to PolyMet as part of the authorized land exchange with the U.S. Forest Service. Publication of draft state permits for public comment. Decisions on state permits (Permit to Mine, air, water, and dam safety permits). Decision by the U.S. Army Corps of Engineers on the Clean Water Act Section 404 permit. Repayment, restructuring and/or conversion of existing debt. Completion of construction finance plan including commitment of debt, subject to the issuance of permits. At July 31, 2017, PolyMet had cash of $4.243 million compared with $18.674 million at January 31, 2017. The company is in discussion with Glencore regarding the convertible and non-convertible senior secured debentures currently due to be repaid upon the earlier of availability of construction finance or March 31, 2018. As of July 31, 2017, PolyMet had spent $125.537 million on environmental review and permitting, of which $119.086 million has been spent since the NorthMet Project moved from exploration to development stage. Loss for the three months ended July 31, 2017, was $2.688 million compared with $1.555 million for the prior year period. 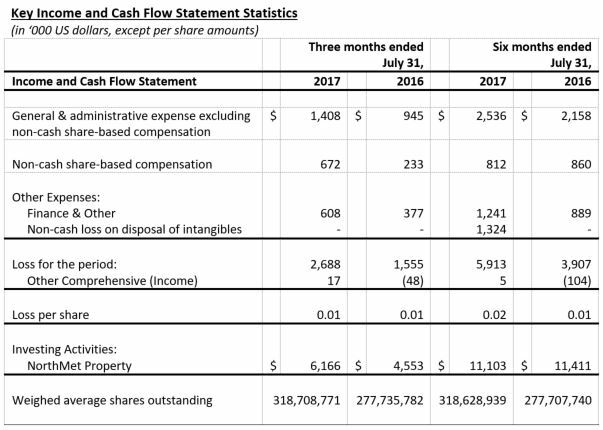 General and administrative expenses for the three months ended July 31, 2017, excluding non-cash share-based compensation, were $1.408 million compared with $0.945 million for the prior year period. Other expenses were $0.608 million compared with $0.377 million for the prior year period. Loss for the six months ended July 31, 2017, was $5.913 million compared with $3.907 million for the prior year period. 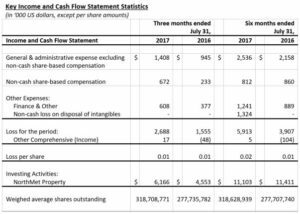 General and administrative expenses for the six months ended July 31, 2017, excluding non-cash share-based compensation, were $2.536 million compared with $2.158 million for the prior year period. Other expenses were $2.565 million, including a one-time non-cash loss of $1.324 million on the disposal of wetland credit intangibles, compared with $0.889 million for the prior year period. PolyMet invested $6.166 million cash into its NorthMet Project during the three months ended July 31, 2017, compared with $4.553 million in the prior year period, and invested $11.103 million during the six months ended July 31, 2016, compared with $11.411 million in the prior year period.